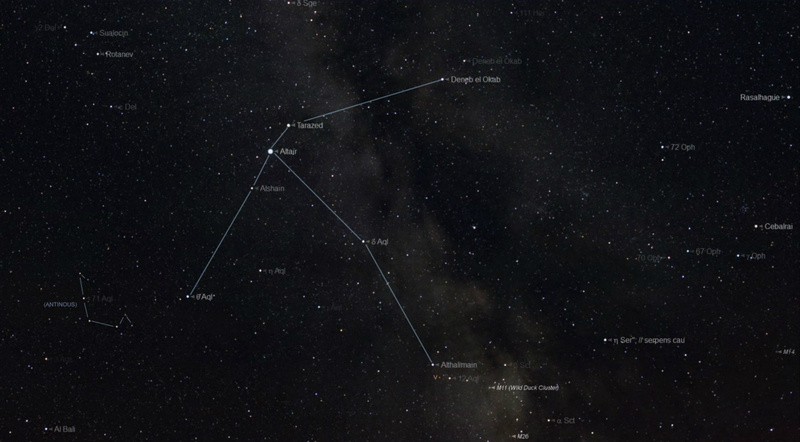 Aquila is a constellation best seen from Spring to Autumn. It culminates, crossing the southern meridian, and so at its highest in the night sky at midnight, in mid -July, and at 22h in mid -August. the constellation of the Eagle lies partially in the Milky Way, to the South of Cygnus the Swan, between which may be seen the four brightest stars of Sagitta, the Arrow, or Bolt. Altair, together with the brighter Vega, in Lyra, and fainter Deneb in Cygnus make up Patrick Moore's Asterism of the 'Summer Triangle. The Celestial equator runs through Aquila. Constellations to be seen south of Aquila are: Capricornus, Sagittarius and Scutum Sobieski. To the west are Serpens Caput and Ophiuchus. Altair is easy to locate because of its position to the south of the other two stars of the 'Summer Triangle', and also because this first magnitude star is flanked by the stars gamma and beta Aquilae, respectively of the 3rd and 4th magnitudes, and this is the chief feature of the constellation, as seen by the unaided eye. To the south east, on the a line, produced by these three stars, lies theta Aquillae. Just beyond theta, is a curved line of faint stars, which once formed the outline of now obsolete constellation of the youth, Antinous. Aquila is an ancient constellation, and has been imagined as an 'eagle' since 1200 BCE, by the early astronomers of the Middle East. The star pattern was also seen as such by the Greeks and susequently by the Romans. In Greek mythology it was the bird that Zeus, King of the Gods, changed into to abduct the boy Ganymede, son of King Tros of Troy, to become his cup bearer in Olympus. The long lost Antinous and the constellation Aquarius, have been likened to the cup bearer Ganymede, as a result of this ancient story or myth. Some interesting novae, ('new stars', although they are not really new at all, but are faint stars that suddenly become hundreds of times brighter) have flaired up, within the boundaries of this constellation. In 389 CE. a nova is recorded which brightened up so much as to be recorded. At its brightest it rivalled Venus, the brightest of all the starlike objects visible from Earth. Another was recorded by Chinese at the astronomers at the Beijing Observatory in the year 1609.. Last century,another nova in Aquila was noticed on June 8, 1918, which became famous in so much that, when it was discovered, it was already at visual magnitude +0.7and so rivalled Altair, the constellations brightest star. the following day it reached its maximum brightness of minus 1.4, and was as bright as Sirius, the Dog Star! After this, throughout the rest of that year, it faded in brightness, with fluctuations, until be the following Spring, when the nova had faded from naked eye visibility. The nova outburst was about 8 degrees to the North west of the star Lambda Aquilae (Athalimain). and an examination of photographic plates of this region revealled that, before the outburst, the star was a faint one of just visual magnitude +11. Interesting Objects in Aquila, and the adjacent area. ALAIR (alpha Aquilae) is the brightest star in Aquila, and one of the nearest stars to The Sun. Altair's visual magnitude is 0.8 and it is the twelfth brightest star in the entire sky. Altair is 16 Light Years distant and rotates on its axis in 6.5 hours. As a result of this rapid rotation this star has a huge equatorial bulge. Our Sun, by comparison, rotates on its axis in 26 days. At a distance of only 16 Light Years , Altair is one of our neighbouring stars. 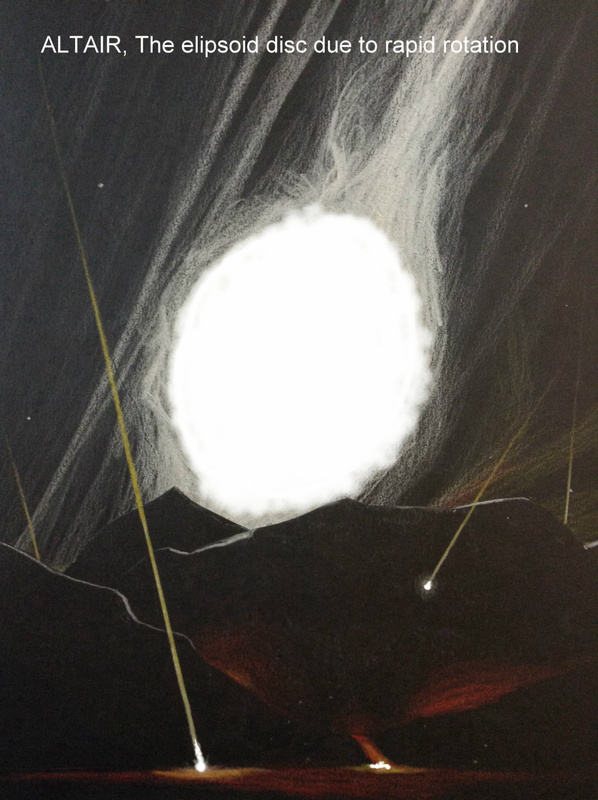 Altair is thought to have a diameter1.5 times that of the Sun. and is 8 times more luminous, and has 5 times the Sun's mass. it is the twelfth brightest star in the entire sky. Altair is 16 Light Years distant and rotates on its axis in 6.5 hours. As a result of this rapid rotation this star has a huge equatorial bulge as this diagram tries to show. Our Sun, by comparison, rotates on its axis in 26 days.